Please Note: Any professional development hours to be used for out-of-calendar days MUST be approved by the campus principal first. June 26-28 - Region 10 "Road Show" in Greenville - Multiple departments from Region 10 have come together to create a conference convenient to teachers living in the Greenville area. Both technology and content-specific topics will be offered. July 10-12 - Region 10 "Road Show" in McKinney - Multiple departments from Region 10 have come together to create a conference convenient to teachers living in the McKinney area. Both technology and content-specific topics will be offered. Sessions will be offered Monday - Thursday during various weeks throughout the summer. See the calendar at the bottom of the page for specific dates. Some specific sessions have already been scheduled based district and campus principal priorities. However, in an effort to meet the needs of FISD teachers, many days are available for Personalized PD, with sessions provided "on demand". See the menu below for available topics, and check the calendar at the bottom of this page for available dates. Then email Fran to select a topic and date to meet. As sessions are requested, they will be added to the calendar below. Click the link at the bottom (the one that says, "Click Here to Register"!) to register for any session on the calendar. Any FISD staff may attend any session, although it is requested that you register ahead of time (if possible) to prepare for number of handouts, etc. 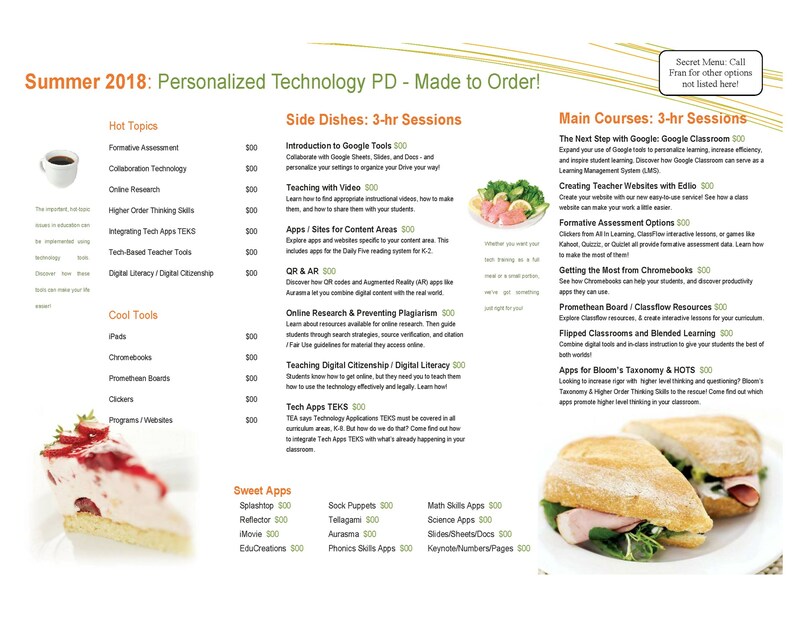 1 - Download the PDF version of the menu if you have trouble reading it online. 2 - "Main Courses" and "Side Dishes" are 3-hour sessions, and may be used for out-of-calendar days. Other topics / apps on the menu are available for one-on-one or small group training, but are not full-blown sessions. 3 - Consider requesting a session as a group to make the most of team planning opportunities. 4 - If the calendar cuts off the names of the sessions, use the Week or Agenda view instead of Month. All sessions will be held at the Junior High School. During June summer school, morning classes will be held in the library and afternoon classes will be held in room __ across the hall. FOR ALL SESSIONS: Please bring teaching materials for a commonly-taught or beginning-of-year lesson / topic in order to create instructional resources using the session information.